SAN JOSÉ, Feb 5 2014 (IPS) - Meeting Costa Rica’s self-imposed goal of being the first country in the world to achieve carbon neutrality by 2021 will depend on the priority given this aim by the winner of the second round of the presidential elections in April. To be carbon neutral means removing as much carbon dioxide (CO2) from the atmosphere as is emitted. But experts are doubtful about the future of the carbon neutrality plan, which was notable by its absence from the election campaign that ended Sunday Feb. 2, when none of the candidates received the 40 percent of votes needed for a first-round win. On Apr. 6, over three million voters will choose between Luis Guillermo Solís, of the opposition centre-left Citizen Action Party (PAC), who took 31 percent of the vote, and Johnny Araya of the governing centre-right National Liberation Party (PLN), who received 29 percent, according to provisional official figures. “Studies show that the 2021 goal is not realistic. We have to take steps towards that target, but realistically we are probably talking about 2025,” Patricia Madrigal, the PAC’s environmental adviser, told IPS. In her view, carbon neutrality should not be seen as an isolated issue, but as a guiding force for all public policies in future four-year government terms. In 2007, Costa Rica decided to become the world pioneer in carbon neutrality, and set itself the goal of fixing as much CO2 as it emits by 2021, to commemorate the bicentennial of its independence that year. Experts and officials consulted by IPS acknowledged that the government that takes office May 8 will face complex challenges in transport, energy, institutional organisation and agriculture in order to meet that deadline. Besides, they say, links must be developed between the national economy and the struggle to mitigate and adapt to climate change. “As long as the goal of carbon neutrality remains unrelated to the transport sector, which generates most CO2 emissions, it is just a slogan to raise international funding,” complained Mónica Araya, the head of Clean Costa Rica, an NGO, who was a government negotiator on climate change until mid-2013. René Castro, the environment and energy (MINAE) minister, told IPS that plans for carbon neutrality have gone forward “75 to 80 percent.” But he also recognised that the transport sector was “notorious” for producing 42 percent of national CO2 emissions. One priority in the move towards carbon neutrality is reduction of dependence on fossil fuels and modernising the obsolete public transport system, made up of hundreds of bus lines and a recently restored railway, linking the four major cities. The parties of the two presidential candidates still in the race are proposing an electric railway for the capital city as well as renewing the bus and taxi fleets. This Central American country with an area of 51,100 sq km and 4.4 million people has its strong points, too, such as a remarkable increase in forest cover, from 21 percent of its territory in 1983 to 52 percent in 2012. This achievement was due mainly to the state programme of payment for environmental services, a local precursor to the United Nations Collaborative Programme on Reducing Emissions from Deforestation and Forest Degradation in Developing Countries (UN-REDD). However, according to “State of the Nation 2013: Challenges for 2014-2018”, a study commissioned by the National Council of Rectors of public universities, the country’s ecological footprint grew by 43 percent between 2002 and 2012, when CO2 emissions reached 16 million tonnes. The ecological footprint represents the biologically productive land and sea area necessary to supply the resources a human population consumes, and to absorb its waste products, including CO2. Both parties with a chance of governing from May onward plan to reform the institutions in charge of environmental management. Currently the environmental authority is the Directorate of Climate Change, part of MINAE. The PAC wants a supraministerial body to direct climate change action, while the PLN is proposing a national environmental strategy. Some people within the state apparatus are also urging for renewal of institutional structures, which they say have been eroded by the imbalance between the task they are charged with and their real powers to carry it out. “The climate change agenda must become a development agenda; it cannot be the exclusive responsibility of MINAE, which is weak and has limited resources,” William Alpízar, head of Climate Change for the ministry, told IPS. To become carbon neutral, Costa Rica must reduce its CO2 emissions as much as possible and compensate for the remaining emissions by the CO2 absorption capacity of the new forests. The private sector is participating in the drive through carbon neutrality certification. The Climate Change directorate has already certified eight companies and another four are being processed. 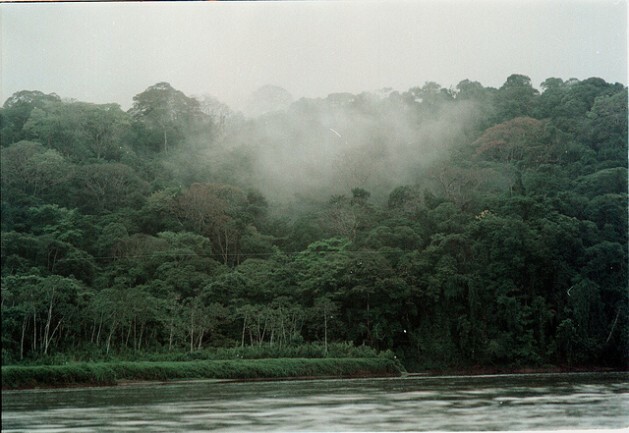 During the Warsaw Climate Change Conference or COP19 in November, Costa Rica presented a proposal for the first CO2 bank, designed to trade carbon credits between CO2-emitting companies and owners of forested lands that act as carbon sinks. According to official estimates, Costa Rica will emit close to 21 million tonnes of carbon in 2021, and it hopes to compensate for 75 percent of this total by carbon capture in its forests, an amount practically equivalent to its current emissions. “According to calculations we performed nine months ago, we will have an excess of 5.2 million tonnes to absorb. That is our target for reduction, and it is divided between transport, agriculture and waste,” Alpízar said. This model has been criticised because the burden of lowering emissions is assigned to local forest cover, without proposing a real change of policy for a form of development that is fully adapted to climate change. “In the name of carbon neutrality we have set aside everything else we need to do about climate change,” Jorge Polimeni, an environmental auditor with the Ecological Flag Foundation, which advocates a more comprehensive adaptation to the hazards of climate change, told IPS. The study “Economic Impact of Hydrometeorological Phenomena in Costa Rica”, coordinated by researcher Roberto Flores, reported last year that between 2005 and 2011, climate change effects cost the country 710 million dollars. when a FEW people live in a jungle full of trees that intake LOTS of CO2, just how hard is it to become “carbon neutral”? Wow are Americans that ignorant. There are many cities in Costa Rica (not just jungles) and the streets are constantly crowded with cars that emit so much CO2 that you can visibly see black smoke coming out of cars as if it was a factory of some sort. Those cars are driving illegally and without a permit because their carbon emissions are too high. Thats why we can’t become Carbon neutral.